A tasting of classic Bordeaux appellations from the world's largest fine wine region. A tasting of 13 fine white and red Burgundies with Rose as your guide. A fun tasting for those who love Barolo and Amarone. Compare 13 wines from the Western Cape - against the great regions of France. A fun sociable evening for the fizz lover - taste 13 sparkling wines from around the world. 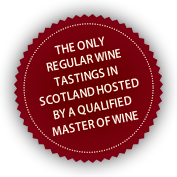 ONLY SIX PLACES LEFT: Sample 13 wines from Loire and Rhone wine regions - with a selection of French charcuterie to match. A fun tasting sampling Italian wine & charcuterie.